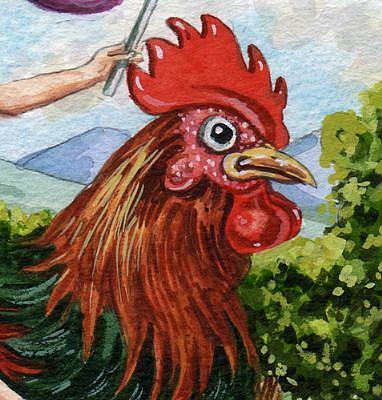 This is the first of my entries in this year's EBSQ Ripped Off show. 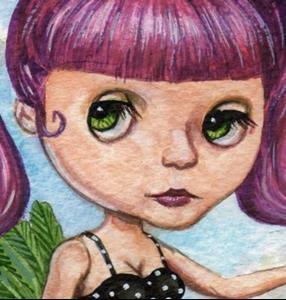 The idea is to pair up with another artist from EBSQ and each do a work based on a piece of the other's work. 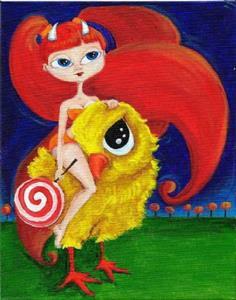 This painting was based on Noelle Hunt's "Chicken To Ride". It's a Blythe doll - these dolls were originally made in the early 70's and had big eyes that changed colour when you pulled a string in the back of her head . I know because I had one! I was given it and if only I had realised then what a collectors item it would be now, as they were only made originally for a year, 1972. A Japanese company started making them again a few years ago and a whole cult has grown up around them. 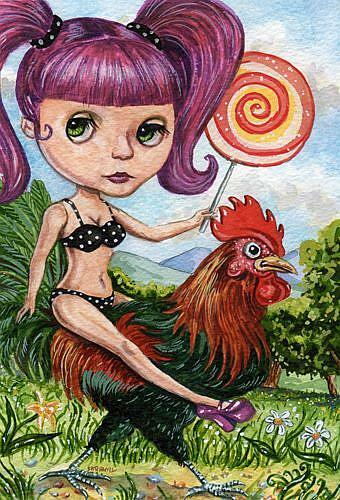 Anyway, my painting takes the Blythe and chicken-riding theme of Noelle's original and mixes it up to make something even more kitsch with a rude joke in there if you have a dirty mind!